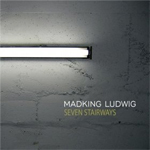 'Seven Stairways' is the second release by Canadian stoners Madking Ludwig. At the root of their sound are the basic elements of all good stoner rock - distorted guitars, slow to mid-paced tempos, some wicked bass lines and a deep bottom end. In fact there is a more noticeable Kyuss influence in Ludwig's music than to some of the other contemporary stoner heavyweights such as Spiritual Beggars and Mannhai. Even so, the Madking doesn't stop there. Throw in dreamy female vocals, flutes, clarinets, tribal beats and Madking Ludwig have a unique new sound, with an old hippie feel to it. When listening to 'Seven Stairways' you get the feeling it's time to break out the hookah, turn on the lava lamps and invite over some mini-skirted go-go dancers. If you could imagine a cross between early-Fleetwood Mac and Deadsoul Tribe you'd end up with something pretty similar to Madking Ludwig. As good as their self-titled debut was, this one might be even better. It will not only satisfy all stoner rock/metal aficionados but should also raise the eyebrows of rock lovers of all genres. The only downside to this album is that with just seven tracks, this disc is over before you know it and leaves you wanting more. To offset that these tunes are all very catchy and I find myself whistling the flute parts when I'm not listening to anything. 2008 has been a pretty strong year for the stoner rock/metal genre and Madking Ludwig's 'Seven Stairways' just might be the best of the bunch. As good as Madking Ludwig's self-titled debut was, this one might be even better. It will not only satisfy all stoner rock/metal aficionados but should also raise the eyebrows of rock lovers of all genres.